Alshon Jeffery has had a grueling past few days. Just months ago, Jeffery exclaimed that he has the best hands in the NFL. In a ironic turn of events, ​the receiver dropped what should have been an easy pass from quarterback Nick Foles, but it instead landed in the hands of New Orleans Saints corner Marshon Lattimore. 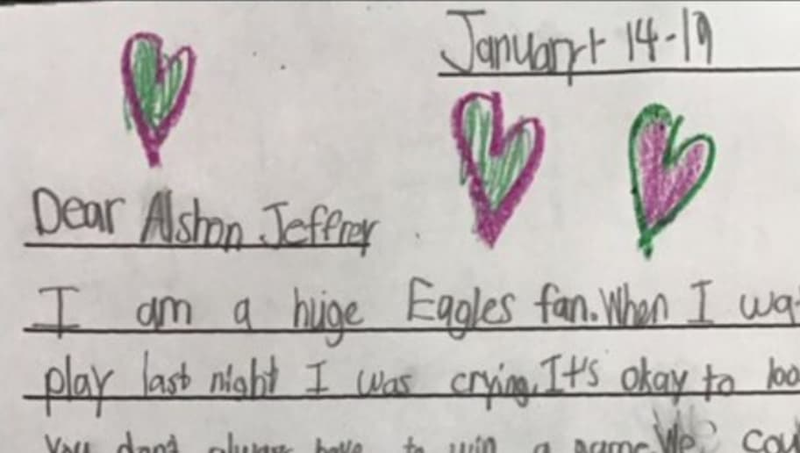 The Eagles were eliminated from the playoffs as a result, and Jeffery handled the mistake with grace at the end of the game, ​placing all of the blame on himself. Wow, it sure is getting dusty in here. In the tough world of sports, a player such as Jeffery is certainly hearing some chirps for his crucial drop in the waning minutes of the Saints matchup. However, this letter should serve as a breath of fresh air for the superstar wideout. A lot of sports fans should take notes from Abigail Johnson.